I wish I had a pet pig or a pet pug. They’re both so cute, and I’ve heard they both make great pets. 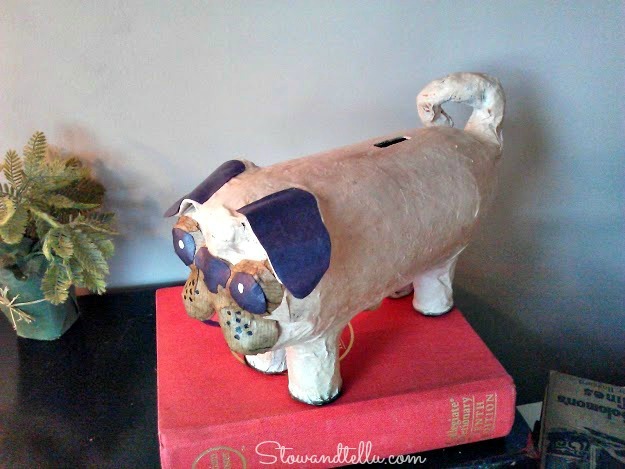 Nevertheless, I have neither, although I do have a cat…but this post is about making a puggy bank. No, you didn’t hear it wrong. I said puggy, not piggy. 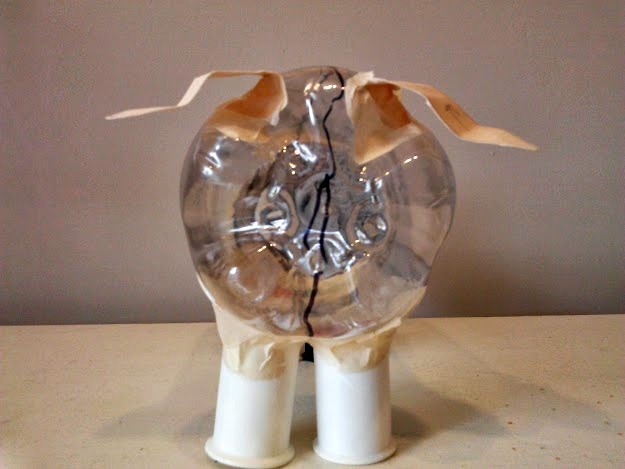 Using the bottom of a plastic soda bottle, which I though would mimic the jowls of a pug dog, I followed Martha Stewart most adorable piggy bank project tutorial. 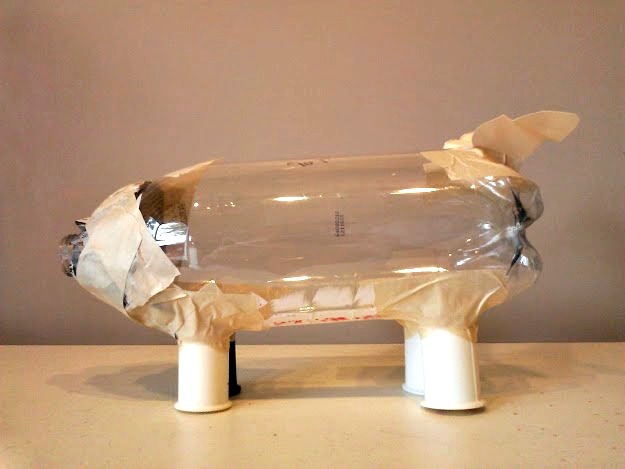 She turned re-purposed plastic soda bottle into a piggy bank which you can see here. In addition, I needed a project for the Hometalk Thrift Benefit for Sheltered Animals Blog Tour, and I thought this project would be perfect. I’m very excited to be part of this amazing blog tour which will benefit the care of sheltered animals. So I decided to make up a pack of puggy banks to donate to the local animal shelter where I found my pet Kitty. 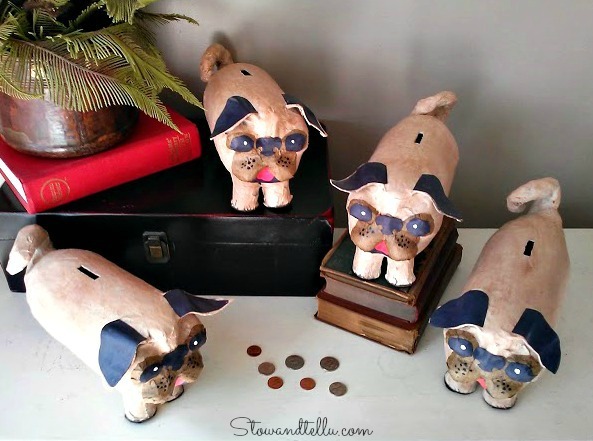 To make the puggy banks, I followed most of Martha’s instructions, which you can find here. 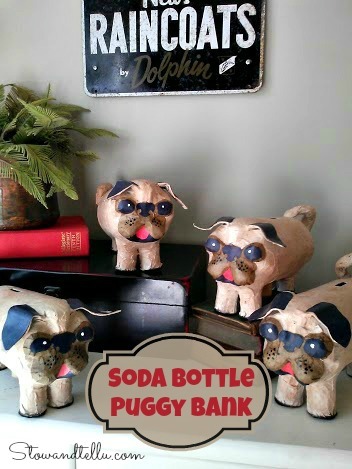 I made a few changes as well, to turn the plastic soda bottle from a pig to a pug. Come along, I’ll show you. I’ve included free printable instructions and a puggy bank face template at the bottom of this post, as well. 1-With a marker draw a line down the center of the bottle, making the top of the puggy head line up with one of the bumps at the bottom of the bottle. 2-Hot glue the empty spools to the bottom of the bottle for legs; and then tape them down to secure. 3-Cut out all of the pieces on the Puggy Bank face template. 4-Using the template piece #8, trace cut out the ears from a file folder or thin card board. 5-Using template pieces #1, 5, 6, and 7 trace and cut out from the black construction paper. 6-Using template pieces #4 and 8 trace and cut out from paper bag or brown craft paper. 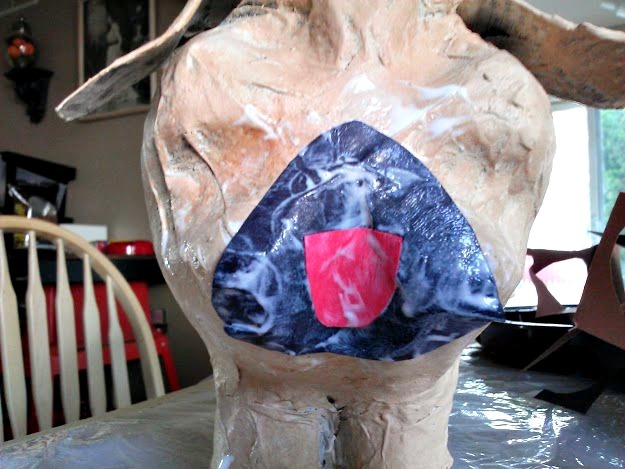 7-Fold ear template on dotted line and tape the ears to the bottle. 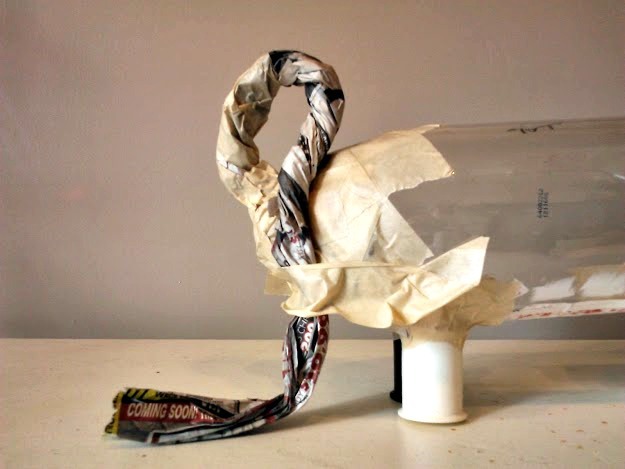 8-Remove the soda bottle cap, scrunch up a piece of newspaper and tape it around the soda bottle nozzle to create the puggy bottom. 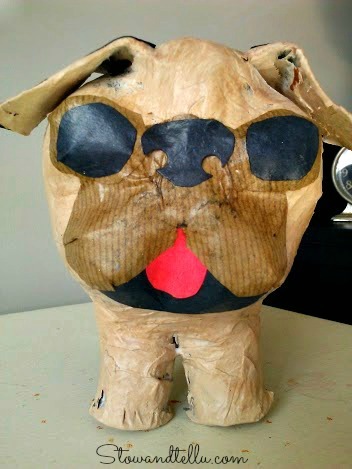 9-Twist 1-1/2 pieces of news paper together to create a tail that starts thicker and gets thinner; and then tape the thicker portion the the back- top side of the puggy bottom. Add more tape, making sure to cover the bottle opening. 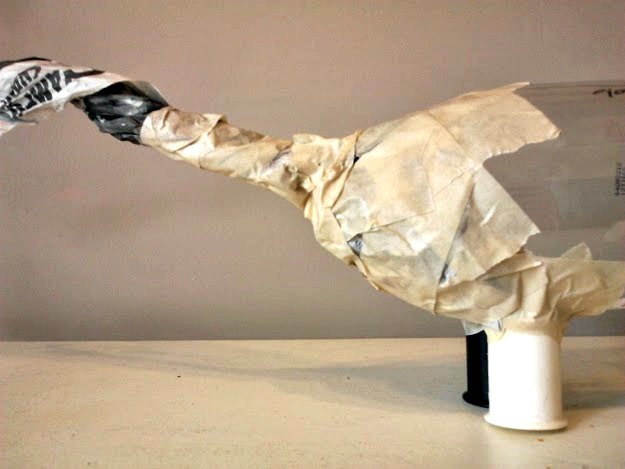 10-Continue to twist the tail and wrap with masking tape until you have a tail shape. Cut off excess. 11-Mix up a flour and water mixture until no lumps. 12-Dip newspaper strips into mixture and start applying. Apply one coat and let dry overnight. 13-Apply second coat and let dry again. 14-Apply the third coat using the black print-only newspaper strips. Let dry. To speed up drying I used a hair dryer, but you can also use a fan like Martha suggests. 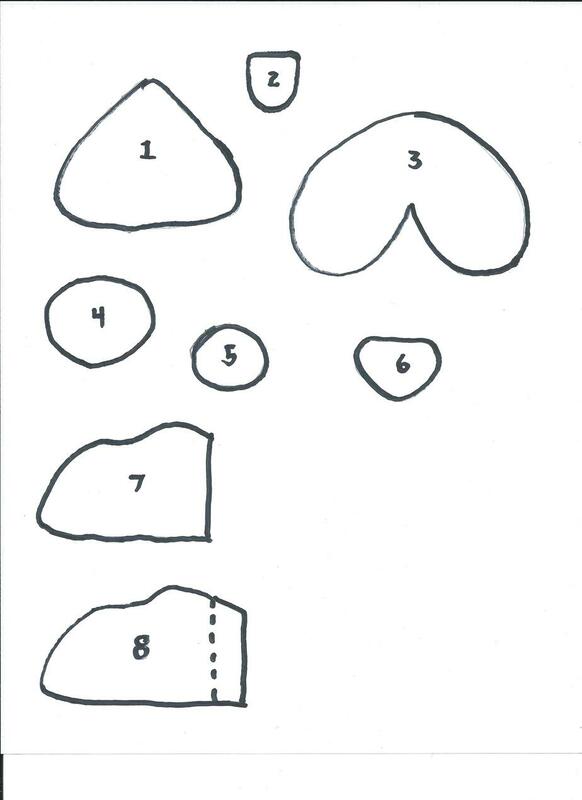 15-Cut out circular hole in bottom of puggy for the cork, making sure hole is smaller than the largest portion of the cork; and cut slit in the top of the puggy for inserting money. 16-Mix paint 2:1 Wedding Cake and Acorn; add 1 part decoupage and a few drops of water and apply with paint brush, two light coats. Let dry. 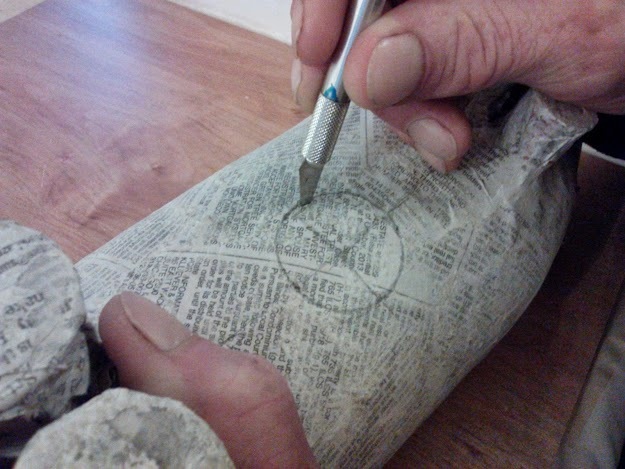 17-Apply a coat of decoupage only. 18-For the nose (piece#6) fold width-wise and punch a hole using hole punch to make nostrils, or cut out small hole if a hole punch is not available. 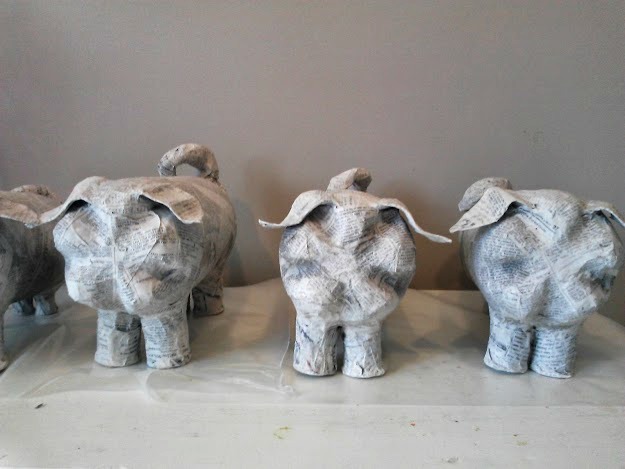 19-Using decoupage, apply pieces #1 and 2 to face, and then and then #3 and 4, and then #5 and 6. Finally attach pieces #7 to ears. Smooth all pieces down with damp fingers to get good adhesion on the bumpy surface. Let Dry. Apply second coat decoupage, smooth down some more, if needed and let dry. 20-Add two white dots for the eyes and black dots as whiskers, let dry. re-coat with decoupage if desired. 21-Dab black craft paint on the bottoms of the paws and around the edges of the paws. 22-Cut out black felt pieces for the bottom of the paws, attach with decoupage – TIP: Trim off a small inside section of felt on inner part of the paws to make the puggy bank more sturdy. These guys turned out cuter than I had expected. 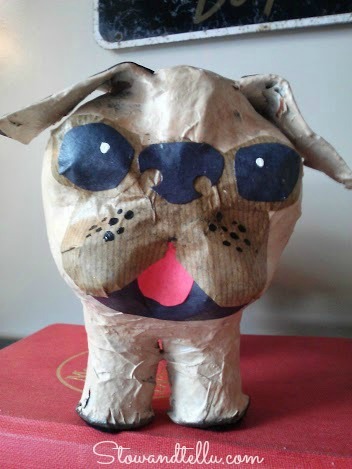 With a little help from some decoupage, paint and construction paper, the bottom part of a soda bottle ends up looking quite like a pug’s face. Aren’t they cute?? This pack of puggies will be donated to the West Suburban Humane Society for re-sale, which will inevitably help to buy supplies for the care of the animals in the shelter. It feels like a great way to give back to the shelter where I was able to find my much-loved pet Kitty! Thank you so much for stopping by and please come follow along on the Hometalk Thrift Benefit for Sheltered Animals Blog Tour. Amy they are so cute! 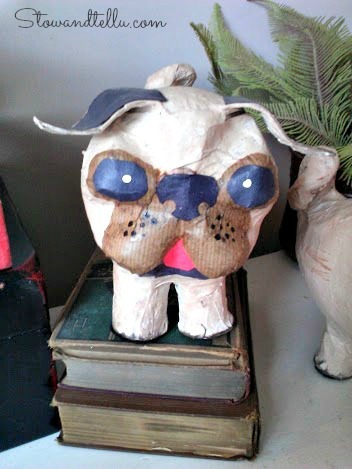 I remember when Martha made hers and its been on my o do list for ages but your pugs are even cuter, what a beautiful way to support the animal shelter. Wow – these are amazing! I can’t believe you started with just a soda bottle and some thread spools! OMG these are the cutest things ever! There isn’t a kiddo alive that wouldn’t want one of these! Great job Amy! Pinning! Oh Amy, those are so cute! I bet the humane society is so pleased! What a great cause and a great project! 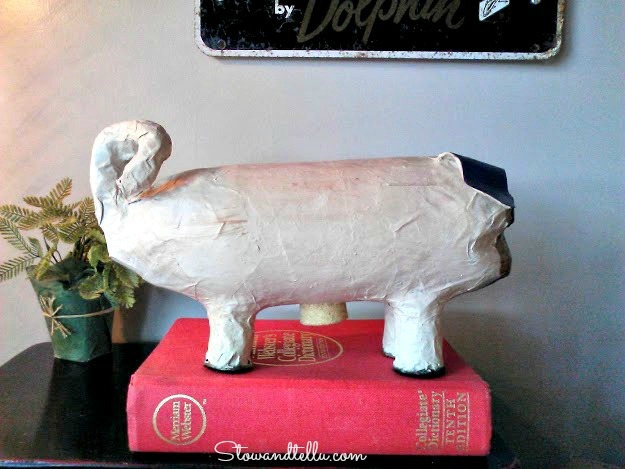 You know how much I love a good upcycle! Oh my goodness!!!! I might have to think about making these when it’s my turn to teach at girl scouts…how long did it take over all? so fun! This just makes me smile – too adorable for words! Oh my goodness, they are soooo cute! You’ve got to share them with us at our Creative Craft Challenge this month! Everyone will love them! In love 🙂 these are so adorably cute and I have a little chug so one of the puggy banks could be a new friend for her lol! thanks for sharing at the new Creative Challenge link party! These are so adorable. My daughter loves pugs so Im going to share this idea with her. Thanks. OMG how cute and creative. They’re amazing and I can’t believe you used a bottle to create them. Thanks for joining us for January’s Craft Challenge. I never would have thought the bottom of the bottle could be shaped into a puppy’s face. Fantastic job on the puggy banks. Thank you so much for sharing with us at the Creative Craft Challenge, Amy! I chose to feature your amazing creations during our February challenge! Hope you stop by and share with us again!